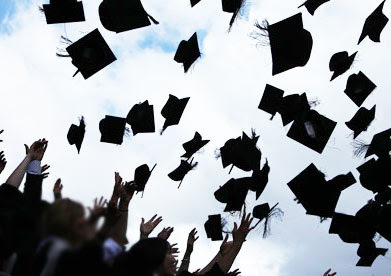 Congratulations to all graduating students of this year! To make your graduation more enjoyable, GoodFilipino.com made a few pick up lines dedicated for all graduates. If you have more pick up lines in mind, please don't hesitate to comment it down on the comment section below so I could include it on the list below. Girl: Sorry boy!.. 4 Years ako.. Boy: Kase ang hirap gumalaw eh, tuwing nakikita na kita. Boy: Kase you fill in the blanks to my heart. Boy: Panay kase utos dito, utos doon. Boy: Ang galing kase ng Marketing Strategy mo eh, lahat kami napapabili... Boom! Boy: Graduation Song ka ba? Boy: Kase pinaluluha mo ko kahit masaya ako. !! Boom.. Boy: Ang dami kaseng gustong umapak sayo.. Pero hindi ko hahayaan mangyari yun. Boy: Magulang ka kase eh, sana Strict ka na lang. Boy: Mxadong malaki ang PICC para okupahin mo? Boy: Pwede bang puso ko n lng okupahin mo? Boy: Kaya pala lagi ka pumapasok, sa isip't damdamin ko eh..
To my readers, please don't be so serious about this post, I just made it for fun and nothing else. And to everyone, you may use the 'Graduation Pick Up Lines' and share it with friends for enjoyment, but please use this wisely and hurt nobody Okay!! Again! Congratulations graduates and good luck to your new venture in life. Comments or suggestions about "Happy Graduation Pick Up Lines " is important to us, you may share it by using the comment box below.